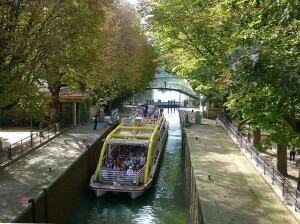 In a city of parks, one that stands out is the cool ribbon of green stretching through three arrondissements on the Right Bank of Paris, the Canal Saint-Martin. It’s also a central element of 19th-century Paris history, and right now it’s getting a facelift. Go there on any day to find a roiling mix of humanity. It’s home to the homeless, a destination for aspiring musicians, a walkway for lovers, a playground for children. All of it in two long, narrow stretches named the Quai de Valmy and the Quai de Jemmapes. 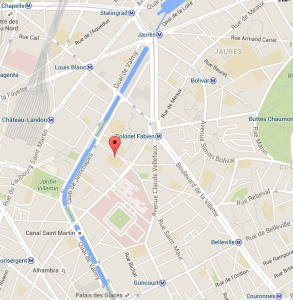 It’s close to the Gare de l’Est, one of the major rail stations, which has a constellation of good restaurants in and around it. The neighborhood had gentrified considerably over the last decade and a half. I spent considerable time walking around the canal doing research for an important scene in my new novel Last Stop: Paris. In that scene, Eddie Grant goes to a (fictional) street leading off Quai de Jemmapes to enlist the aid of his old friend, the retired general Jeremy Bentham, in finding the antagonist he knows is there but can’t identify. It kicks off the major second-half plot of the book, and Jeremy introduces us to several unsavory veterans of East German intelligence who furnish the information Eddie needs to solve the puzzle. As you can imagine, any 114-year-old urban waterway picks up a lot of stuff, so once every ten years or so the City of Paris mobilizes, builds a temporary dam at each end, drains the water, and looks to see what treasures have wound up under the water. Last time, in 2001, the workers dragged away 40 tons of muck and mire, plus some random pieces of gold, bicycles, motorcycles, and the occasional gun. They’ve already found one gun this year, and solved the mystery of where many of the missing Vélib rental bicycles went. They’ve also carried off four and a half tons of fish, from sunfish to 40-pound carp, for release upstream and downstream. The first Emperor Napoleon had the canal built in 1802 to provide water for the city, whose residents — or at least the poor ones, which was almost everybody — suffered from a serious water shortage. It connects two rivers, the Ourcq in the north (via the Canal de l’Ourcq) and the Seine in the center of the city. Part of it is underground (there was a risk at one point that the whole thing would be filled and paved over, but good sense prevailed). It’s now part of the system that furnishes the non-potable water used to clean the streets. For a good explanation of that, see this post from Parisian Fields. There’s more on the canal at Wikipedia. The Guardian had a good story about the cleanup, as did the Daily Mail.